IN STOCK ! BP-170L: 6 x AA Battery Case for ICOM IC-W32A/E, IC-W31A/E, IC-T7A/E/H, IC-Z1A, IC-T22A/E, etc. Designed by BATTERIES AMERICA. Replaces original BP-170, but has added benefit of increased Wattage for TX. Case extends down below the radio about 1". Part # BP-170L (also known as BP-170h). Holds 6 x AA cells (Alkaline, or NiCd, or NiMH) for higher-Watt TX capability. If Alkaline cells are used, the BP-170L provides about 9VDC (4.5Watts+). 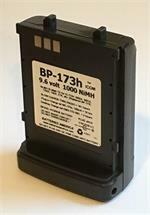 BP-170L has built-in protection to prevent alkaline battery cells from being recharged. If you use NiCd or NiMH batteries in the BP-170L, you will need to remove the cells to re-charge them. 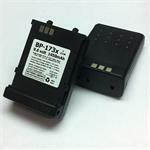 BP-173xei : 9.6 volt 800mAh eneloop battery insert - for rebuilding ICOM BP-173. 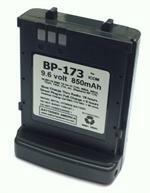 BP-173xei : 9.6 volt 800mAh eneloop battery insert - for rebuilding ICOM BP-173. Fits inside original ICOM BP-173 casing. Arrives to ou PRE-CHARGED & READY TO USE ! 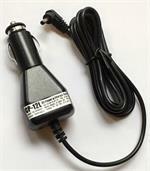 EMS-173 : Desktop Rapid charger for ICOM-style 9.6v batteries such as BP-173, BP-173h, BP-173x (NiCd & NiMH). 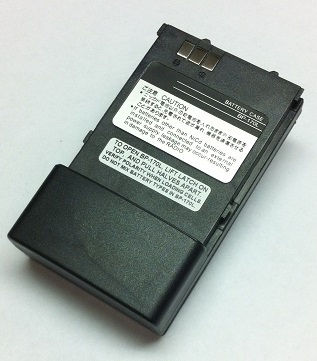 BP-173xxe : 9.6v 950mAh ENELOOP NiMH battery for ICOM radios. Replaces BP-173. Arrives PRE-CHARGED & READY TO USE. Retains its charge when not in use.